On Huw’s 20th birthday there are some reflections as well as some positive news about the Huw Thatcher Trust. The Trust has now raised over £106,000 and there are still some funds coming in. Here is a summary of the money we have all raised together and how it is being used. I visited Daniel Yorath House near Leeds on Huw’s birthday which has benefitted from £20,000 from the Huw Thatcher Trust. I saw the physio kit in action and it was great to see everyone there including Fletch from our 19forHuw bike ride last year. I was also made an Ambassador of BIRT on behalf of everything we have done together with The Huw Thatcher Trust – and given a nice framed certificate. We really have done something amazing together. As well as helping people who’ve had strokes or accidents (mostly quite young people) get better more quickly, the physio kit can be used by non-specialists so has saved BIRT a lot of money and given more people the chance to use the kit. If you’ve donated or done something for the Huw Thatcher Trust then you’ve helped a lot – and done it in the name of a fantastic relative or friend who I absolutely know is so special to a great many people. The funds are being used at other locations too – and raised at various places and in various ways too. 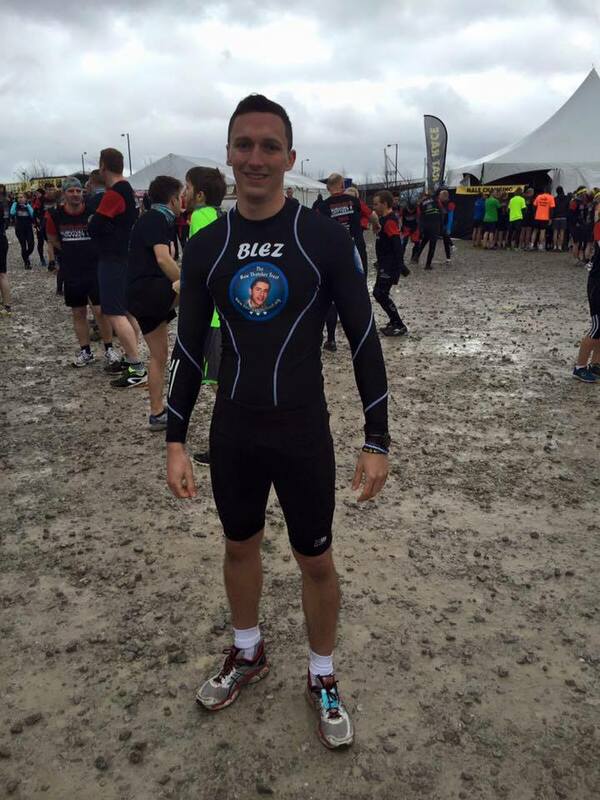 It is a tribute to Huw that his sports teacher Ryan Blezard recently raised over £1,000 taking part in a tough endurance event. I know this meant a lot to Ryan who said “I had the pleasure of teaching Huw in my early days at Holmfirth High School; he was one of the most kind-hearted and talented students who was the captain of the first ever school side I coached. His legacy and memory is now firmly embedded into the school community and none more so than in the PE department where our students walk past his signed shirt hanging with pride on the PE corridor on a daily basis, inspiring the youngsters of the future”. I was very touched by this and the full article in the Huddersfield Examiner can be seen here. Thank you Ryan, a heartfelt and fantastic effort. Here is Ryan who even wore special kit with a beautiful photo of Huw. 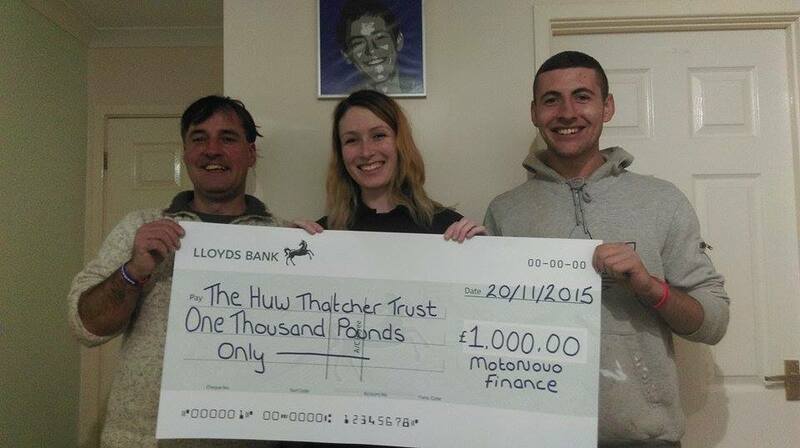 Equally with many thanks to Alex Layton and everyone at Motonovo in Cardiff there’s a further £1,000 for the Huw Thatcher Trust. A lovely young woman from a fantastic family, who never met Huw but saw the hurt and love of Huw’s extended family…..who cared about a beautiful boy who lived 200 miles away who was a big Cardiff City fan …… and suggested that one of the nominated charities for her work charity day was the Huw Thatcher Trust. Thank you Alex, you’re a star. Huw and who he was continues to inspire touching and generous acts that show the best in people …. far and wide. Here’s Alex pictured with Huw’s uncle (Steve) and cousin (David) who leave nearby. On Huw’s 20th birthday when we are left reflecting on our memories of him still as a teenager I wanted to include these lovely pictures of Huw. The first picture is at Meadowhall just after Huw’s first birthday. He was delighted to be wearing his first little pair of shoes. We were both proud to be having our photo taken together. 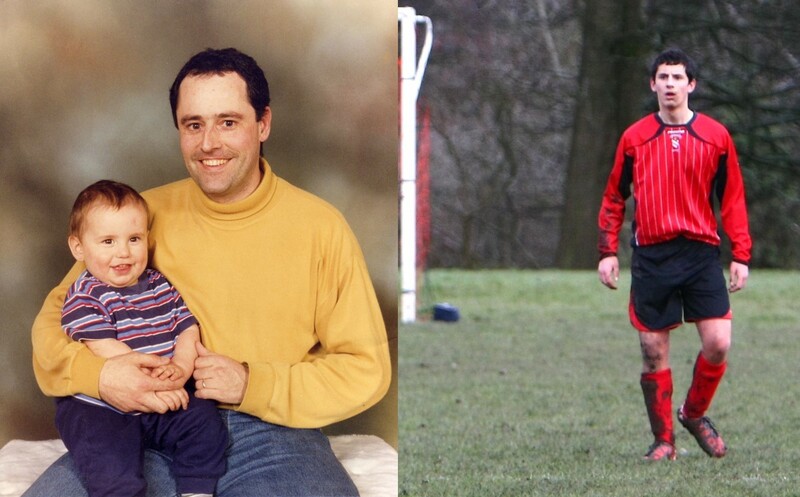 The second picture is at ‘Little Wembley’ just after Huw’s 15th birthday. He had grown into a tall strong young man and was sporting his new size 11 boots. We were both proud he was Hepworth’s centre back. 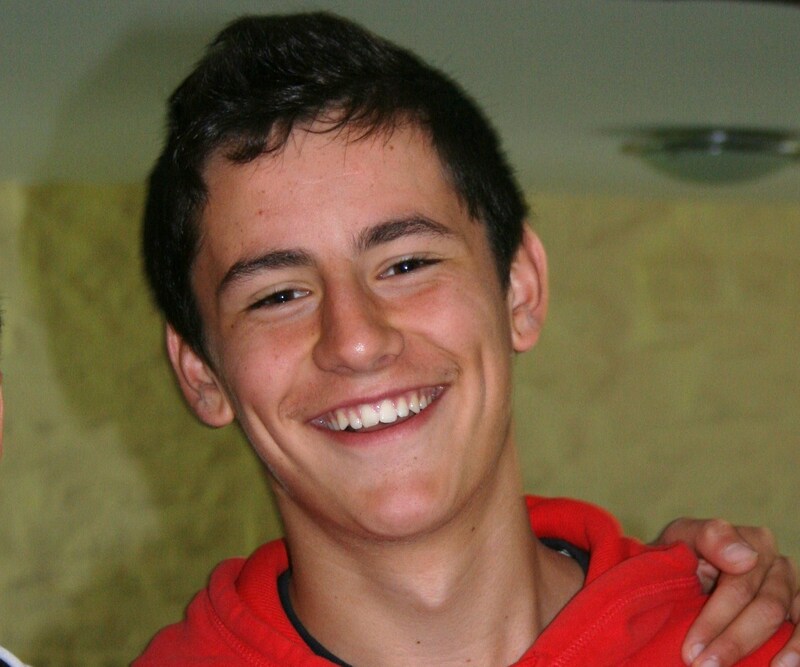 When he was 14 or 15 we used to smile about the picture of the cute little boy being held tight and safe by his Dad. On your 20th birthday Huw I am as proud of you as ever. Still I hold you tight; I will hold you tight forever.